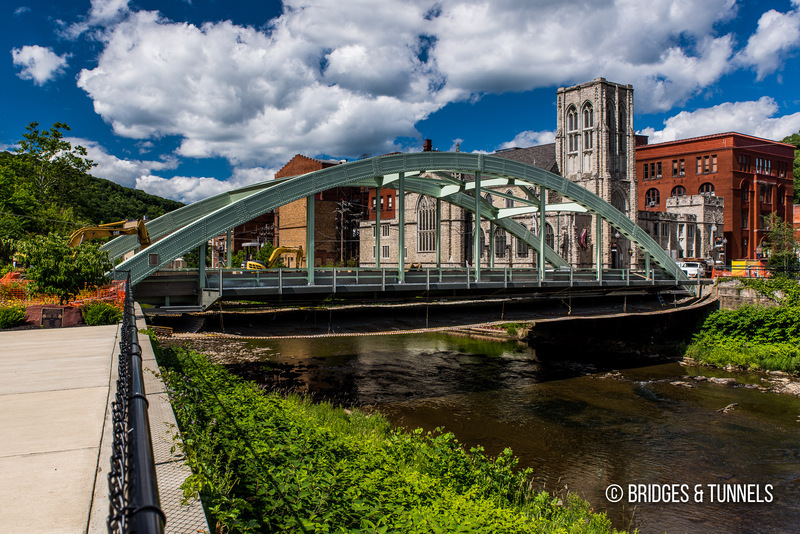 The distinctive and historic Center Street Bridge carries Center Street over Oil Creek in Oil City, Pennsylvania. 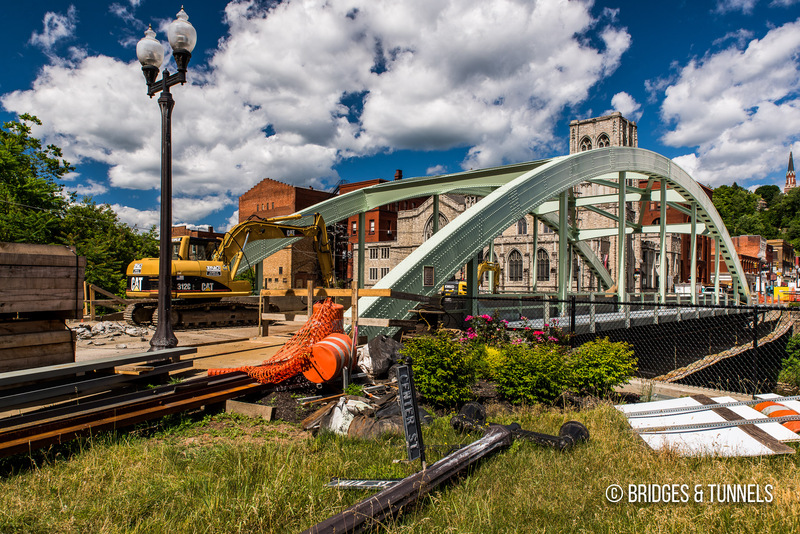 It is one of two tied arch bridges in the state. The first county-owned bridge, a single lane wooden crossing for streetcars and horse-and-buggies, was constructed at the foot of Center Street in the early 1850’s. 9 It was destroyed in a flood on March 17, 1865. The second iteration was opened on July 27, 1866 at a cost of $65,000. The single-span wrought iron arch and truss, wide enough for two lanes, measured 180 feet long and 40 feet wide. Tolls were charged until 1870 when it was acquired by the county. Heavy rains wrecked havoc in the Oil City region on June 4, 1892, causing widespread flooding along Oil Creek. 5 That night, flash flooding caused tanks of oil, distillate and naptha to be removed from their foundations, floating down Oil Creek towards Oil City. The next day, as a yellow chemical haze rose from the water, lightning struck, causing an immediate explosion and subsequent fire that ravaged the city. The White Bridge was destroyed in the fire, its steel beams twisted from the intense heat. Source: Babcock, Charles Almanzo. “Ferries and Bridges – Electric Roads.” Venango County, Pennsylvania: her pioneers and people. The Center Street Bridge was rehabilitated again in 1985. A $2.15 million rehabilitation project 3 on the Center Street Bridge began on March 14, 2016 1 and was completed on October 27. 2 Work involved steel and concrete repairs, new asphalt roadway approaches, new concrete bridge approaches, refurbished hand railings and new paint on the steel. The improvements are expected to add 50 years to the service life of the crossing. The bridge will receive decorative and colored LED lights along the bridge in the spring of 2017. 3 The privately funded, $80,000 project is being built by Vincent Lighting Systems of Pittsburgh. 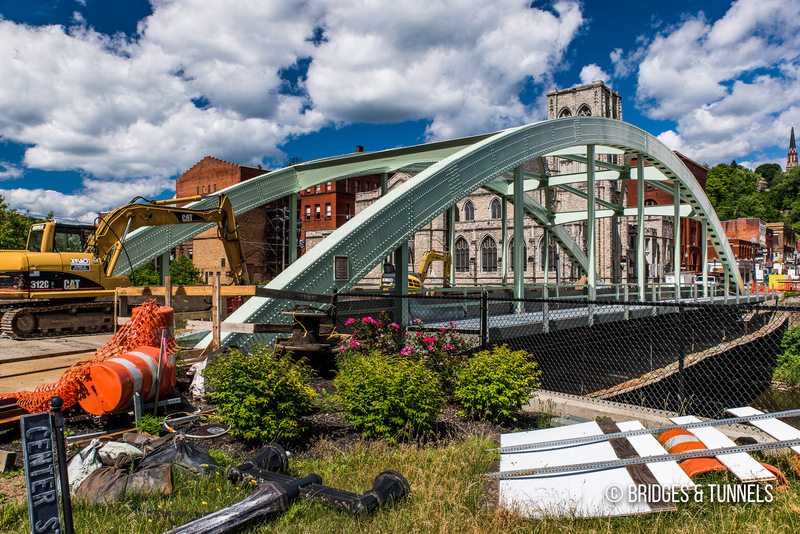 “Rehabilitation Work on Center Street Bridge in Oil City to Begin.” Pennsylvania Department of Transportation, 2 Mar. 2016, article. “PennDot Announces the Reopening on the Center Street Bridge.” Pennsylvania Department of Transportation, 27 Oct. 2016, article. Bauer, Jake. 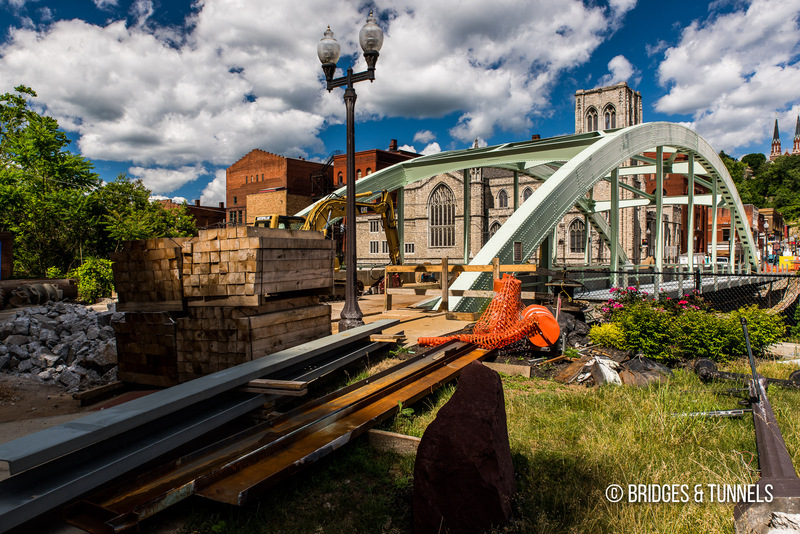 “City Officials, PennDOT Celebrate Center Street Bridge Reopening.” Explore Venango, 28 Oct. 2016, article. “Readjustment Necessary.” Oil City Derrick, 3 Mar. 1931, p. 6. Arkwright, Martha. “Fire-Flood Still Ranks as Oil City’s Worst Disaster.” Oil City Derrick, 3 Jun. 1967, p. 6. “Center Street Bridge Repair Work Planned.” Oil City Derrick, 4 Feb. 1976, p. 15. “Downtown Span Scheduled to be Reopened Tomorrow.” Oil City Derrick, 25 Mar. 1976, p. 13. Babcock, Charles Almanzo. “Ferries and Bridges – Electric Roads.” Venango County, Pennsylvania: her pioneers and people, article.